Full Service Client since 2002. Antenna Coordinates=46-48-08 N, 113-58-21 W (NAD27). Overall Height Above Ground Level=160 feet. ERP=3.6 kW Horizontal + 3.6 kW Vertical, Peak of Beam. ERP=3.4 kW Horizontal + 3.4 kW Vertical, at Horizon. 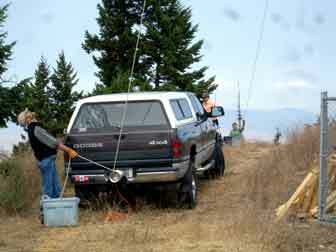 In September, 2007, we were asked to help construct a new FM station for Clear Channel Radio in the Missoula market. The new station would share the transmitter building, tower, and antenna with existing station KBAZ at the Mount Dean Stone Electronic Site. 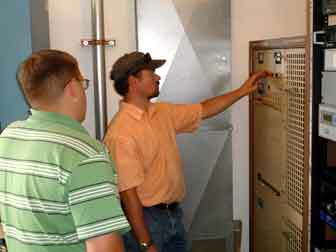 Local Chief Engineer Todd Clark and David Hubbard assess the equipment layout, starting with the new ERI combiner. 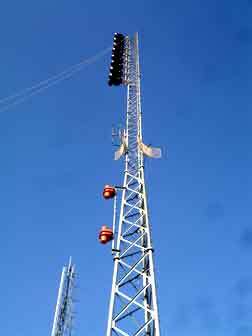 Americom Tower was contracted to take down the KBAZ antenna and replace it with a new, combined antenna for KBAZ and KXGZ. At left, Wayne Nelson with the load line and winch. On the right, David handles the tag line. 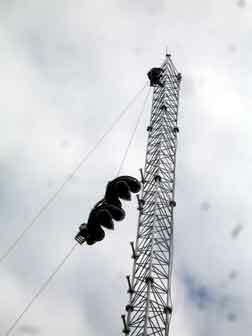 The first two bays of the new antenna are hoisted on the tower. The new KXGZ transmitter is a Continental 814C, rated for 3.8 kW output. 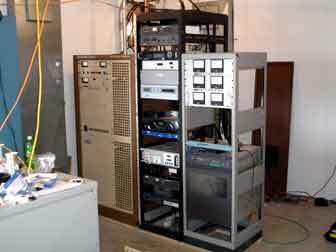 The tall rack houses the STL relay for KLYQ-AM, the Bext exciter for the KBAZ main transmitter, a Burk remote control, STL receivers for KBAZ, KXGZ, and KENR, audio processing for KBAZ and KXGZ, a backup exciter and amplifier for KBAZ, and RPU relay. The shorter rack on the right houses wattmeters for the combiner inputs and output, audio processing for KENR, and the KENR booster transmitter. 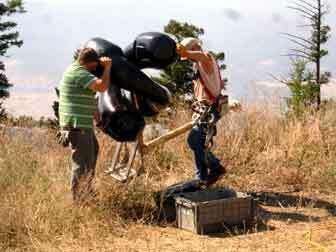 As David watches, Todd fires up the new transmitter into a dummy load. 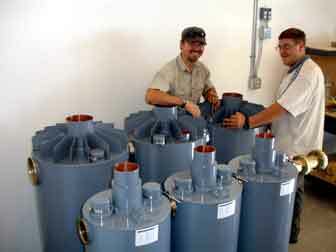 David and Wayne carry one of the new antenna bays. All eight bays of the new ERI combined antenna are mounted on the tower. 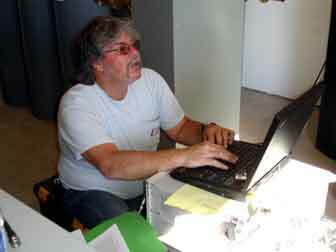 ERI technician Mark Garrison with laptop and network analyzer tunes and certifies operation of the combiner. We assisted in the construction of this station in 2007. Clear Channel Radio Missoula Web Site.